Pre-measured, Dropps are extremely convenient pacs of liquid laundry detergent that consumers toss directly into the washer and go! With Dropps, there’s no mess: no longer will you lug around a heavy jug, measuring and pouring copious amounts of detergent that cause spillage—these little eco-friendly pacs dissolve completely in the washer. They are not only versatile enough to work on all fabrics and colors, but also in all temperatures and washers—including HE machines—unlike its competitors. Dropps provide a newfound softness and freshness in everything from designer jeans to intimates, thanks to the enzyme-free nature of the product. In simplifying the whole laundry process from store to laundry room, Dropps produces multiple benefits crammed into one tiny pac. It even allows Mom to do laundry with one hand, while holding her baby in the other! Greener for the planet, the Dropps formula has been approved by the EPA’s Design for the Environment (DfE) program, which recognizes formulas with safer chemistry. In removing all water from the formula, we have made it so concentrated that we can put the liquid detergent in a water soluble film, which is 100 percent biodegradable. The small, pre-measured pacs allow us to ditch the detergent jug entirely, thereby reducing the plastic used in packaging the product—along with the energy that goes into shipping it. If you were to compare Dropps to traditional laundry detergent, the same amount of wash loads can be shipped in 1 truck carrying Dropps versus 3 trucks carrying traditional jug detergent. The space reduction extends into the home. The product is incredibly lightweight and space efficient; it takes up less space in the laundry room and on the store shelf. We’ve taken this one step further and teamed up with TerraCycle® to create an innovative recycling solution for its packaging, making Dropps a 100% zero waste liquid laundry detergent. You can’t go wrong with Dropps: It’s the jack of all laundry! Fresh scent, scent free and baby! You can purchase Dropps ONLINE. A pack of 20 loads is $6 or $1 for a pack of 2 loads! I received 2 packs to review. 1 of the Fresh scent and 1 of the baby Dropps. I like the fact that dropps are 6x the normal concentrate of normal detergents. 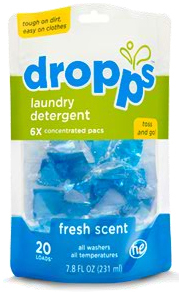 These little dropps pack a big cleaning power! They are very convenient just toss in the washer. add clothes and push the button to start the laundry! Woohoo ~ how easy is that! Even my kids can do laundry now:) Dropps are awesome I washed clothes in both hot and cold water to see which way Dropps cleans better! They were great in both! I love that Dropps are great on all fabrics, all colors, all temps and all washers! disclosure~ I received samples of Dropps in order to write this review. all opinions are my own. I love the convenience of this! Did they work well? I am always looking for ways to get the mess out of my husband's work shirts. They never seem clean enough.